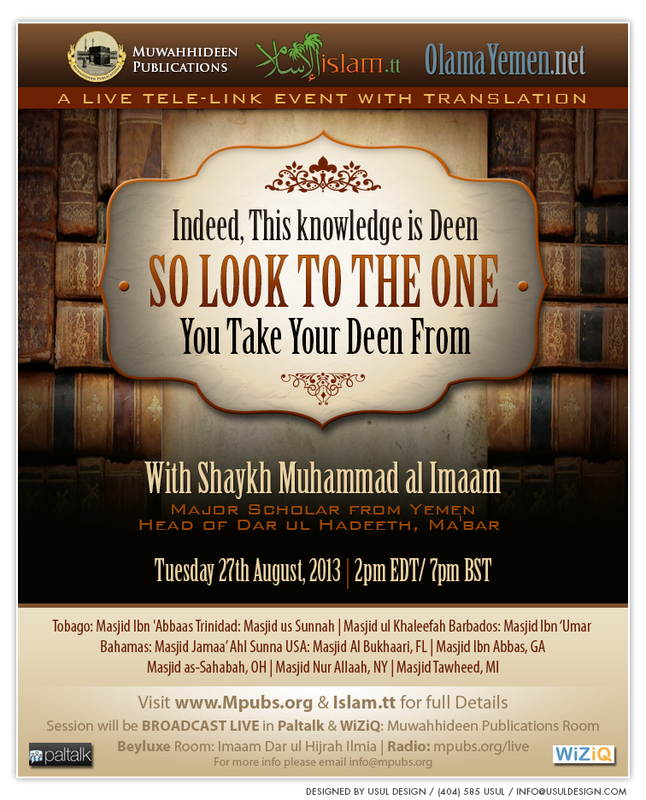 Muwahhideen Publications is pleased to announce a LIVE Tele-lecture with the Noble Shaykh Muhammad Ibn ‘Abdullah al-Imaam (May Allah Preserve him) on Tuesday 27th August 2013. The Shaykh supervises Markaz Dar-ul-Hadeeth in Ma'bar, Yemen and is one of the major scholars of our time, May Allah preserve him. This lecture event will be broadcast LIVE in three Masaajid in Trinidad & Tobago and six Masaajid in the U.S. Masjid Al-Bukhaari, Florida, Masjid Ibn 'Abbas, Georgia, Masjid Nur Allaah, New York, Masjid as-Sahabah, Ohio and Masjid Tawheed, Michigan. This session will be translated LIVE into English In shaa Allah.